Aerocycles are main dealers for leading brands in bikes, clothing and parts. We have built on our reputation as knowledgeable, relaxed and friendly specialists who are also passionate cyclists. We are keen to form links with the local community and share our enthusiasm for this great sport. So call in and chat. We welcome everyone from Mountain Bikers to Commuters, from Road Racers to Penny Farthing owners. Everyone is met with the same smile and informal professionalism. 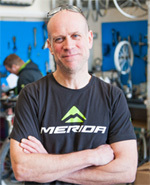 Aerocycles was established by Steve Foster in 2010. He comes from a family that was totally obsessed with cycling and setting up his own shop was a dream come true. Many years later he is still living the dream! Aerocycles are proud supporters of Haverhill Cycling Club, and have been ever since its conception back in 2011. Haverhill Cycling Club is a family-friendly cycling club based in Haverhill, Suffolk. The members are like-minded cyclists who formed the club in 2011 and have expanded it since then. The club became official in February 2013 when it was affiliated with British Cycling. To accommodate the ever growing number and abilities of riders in the club we aim to offer a variety of distances and paces in the hope that there will be something for everyone on a Sunday morning. The coffee stop is always a popular feature of these rides so remember to pop some cash in your pocket. All rides leave from Haverhill Market Square at 9am sharp. Casual Ride; A ride of between 20-25 miles. Pace is not specified. Riders need to confidently cover this distance so some previous cycling experience would be advantageous. Suitable for beginners or those looking for a more leisurely ride. Social Ride; A ride of between 40-50 miles at a pace of 14-16mph. These rides are never dull with the guarantee that you will be taken on roads that you never even knew existed. Suitable for experienced fitness, audax and touring cyclists. Pace Ride; A ride usually in excess of 50miles at an average speed of 17mph+. Hang on to your hats as there will be periods of continuous fast riding. Suitable for experienced riders with endurance levels capable of riding with sustained periods of speed.